Hotping, Billb, Blue Moon, LifeSong, Rob, Kermit, Wreck..We've got more TV shows.. Can you dig it? Justice for Natalee Holloway picks up several years after the events in the original movie. It chronicles the ongoing mystery of the 2005 disappearance of the Alabama teenager during her senior class trip to Aruba and her suspected killer Joran van der Sloot's series of conflicting (and so far false) clues about her fate. When van der Sloot demands $250,000 from Beth to reveal the location of Natalee's remains, she and her attorney John Kelly partner with the FBI to build a case against him. But before they can, van der Sloot is arrested in Peru for the murder of a young woman on the 5th anniversary of Natalee's disappearance. Looks like someone Anthony Hagedoorn knows used a spare key to take his boat out and caused some damage. Don't know if he filed a complaint or not. publication: diahuebs, 24 feburary 2011.
oranjestad (aan): police of oranjestad owing to bay atende anything at the pier of seaport relaciona cu hortamento of one boat of placer. the informe owing to arrive at oido of central of police by centro of alarma. at once owing to despacha patrol at the pier y police owing to come across cu he of inicialnan a.h.d. of 41 year of edad. according version of a.d. cu for 5’or of nightfall past owing to let his boat of placer cu is nabega bao of the name “tranquilo” ancra near of pier of palm tours situa at palmbeach. during oranan of night one tourist cu the conoce owing to yame y owing to bise cu the was on yacht “tranquilo” y the boat was have problem y the wanted come ground. denunciante owing to bay haci his investigacion y owing to come localiza his yacht tranquil at seaport marine. locual owing to sosode according denunciante, cu he cu is work pe of inicialnan d.w. owing to using key spare, using the yacht without autorizacion of the owner, for colmo apparently bao of influencia. y also owing to cause damage at the yacht. can cierto enough coin the will can bay costa for fix. Sounds like something a stupid drunk kid would do. Is Sebastian back from DC? 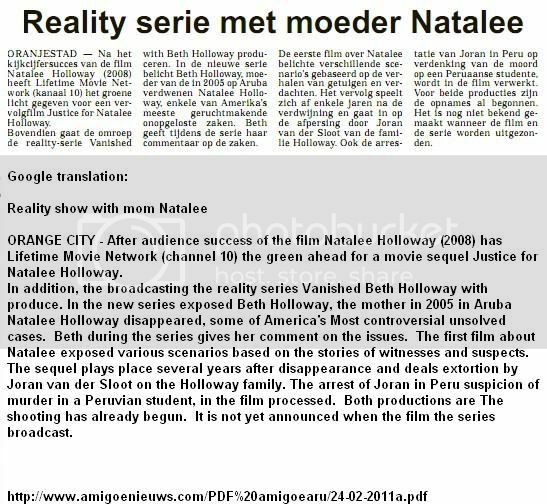 Birmingham (WIAT) The mother of missing Mountain Brook teen Natalee Holloway has reportedly signed a movie and reality series for the Lifetime cable network. Beth Holloway will host "Vanished with Beth Holloway", a ten-episode reality series looking at unsolved crimes and offering her insight into them. There will also be a sequel to the 2009 Lifetime movie about Natalee's disappearance which set ratings records for the cable network. Natalee Holloway disappeared in 2005 on a trip to Aruba with Mountain Brook High School classmates. She was last seen at a club in the company of Joran van der Sloot. The young Dutchman is still considered the prime suspect in the case but has never been charged by Aruban authorities. I would think he's back from DC, but not sure about that. Any news from the court regarding Dr. Phil vs Kalpoes? We have had the boat pulled out of the water today. After what had been done, it seems we have a tough boat. Reports of it being beached with waves pounding it, reversed off the beach banging into De Palm pier. The dammage visible so far seems to be less that expected. Good evening, did you see the documents Klaasend posted at the beginning of the thread? Nope, nothing new that hasn't already been posted. Apparently there was a group, or individual (not confirmed yet) that decided to take her for a spin. When I was notified of this, I found the boat, back on its mooring with engine running and a visitor from the USA on board. The guy who too...k the boat was at Bugaloe bar drunk out of his mind. We took the boat to the Renaissance Marina in Oranjestad for damage control. Visible damage to the topsides (cosmetic) on the starboard side were imediately visible. The case is being investigated by local police (God help me)! Natalee Holloway has been missing since 2005, but the fascination with her disappearance remains stronger than ever. In fact, Lifetime is developing a sequel to its top-rated 2009 telefilm about Holloway, as well as a reality series starring her mom, reports Deadline.com. "Justice for Natalee Holloway" takes place several years after the first TV movie and will follow Beth Holloway (Tracy Pollan) on her search to discover the fate of her teenage daughter, who disappeared on a senior class trip to Aruba. Beth and her attorney team up with the FBI to build a case against suspected killer Joran van der Sloot (Stephen Amell), who has demanded $250,000 to reveal where Natalee's remains are located. But on the fifth anniversary of Natalee's disappearance, he is arrested in Peru for the murder of another young woman.